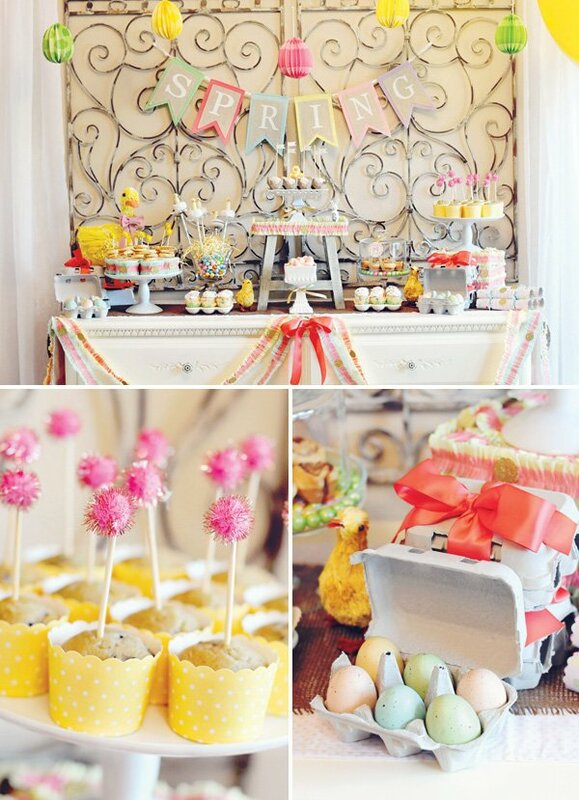 Bri and Amy of The Saavy Moms Guide hosted a ridiculously CUTE Easter themed “play party” this year. 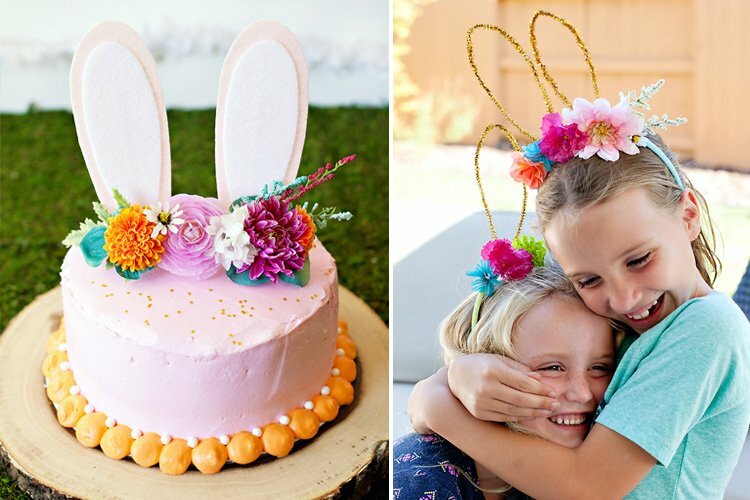 Modern, creative, budget-friendly, FUN – this party has it all… including bunny tails for everyone! We bought vanilla cupcakes from the grocery store topped with white frosting. 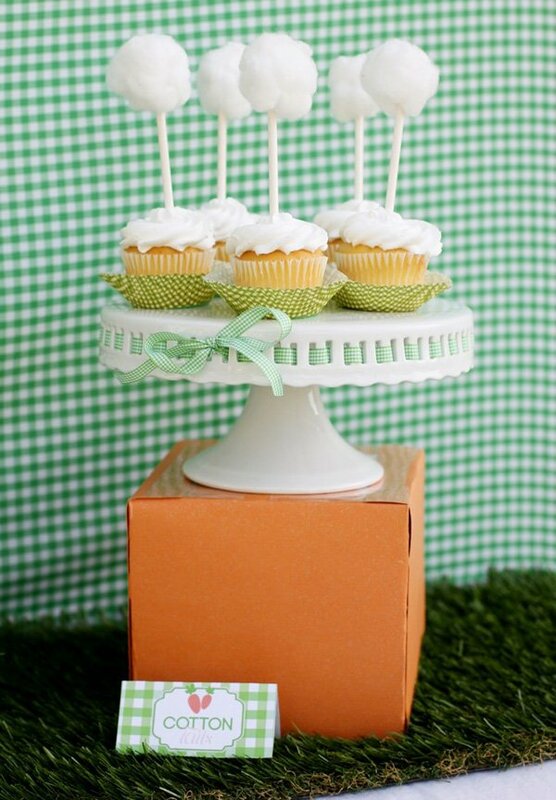 We then created “cotton tail” toppers using lollipop sticks and cotton balls and placed in green and white gingham cupcake liners from Michaels. The Sugarbelle’s carrot sugar cookies were placed on white square plates from Wal-Mart. 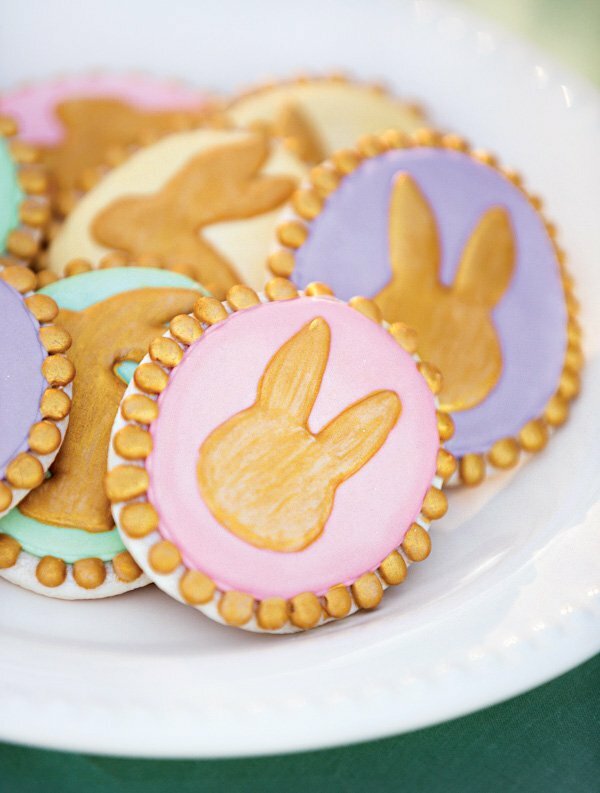 The brownie bunnies were cut using bunny shaped cookie cutters and placed on wooden dowels. We then created a picket fence display made from garden fencing, cut and zip tied to the size we needed. To create a natural earthy feel, we filled the fencing with craft shred purchased from Dollar Tree. The bunny biscuits were an easy recipe inspired by Woman’s Day. The ingredients were minimal: pre-made biscuits, honey, coconut, marshmallow and chocolate chips. These were also placed on a white rectangular plate from Wal-mart. 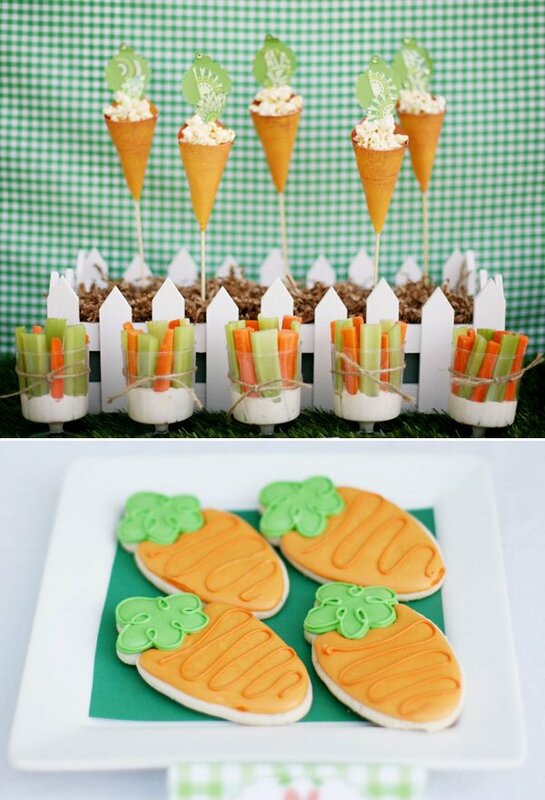 The carrot patches were another inspiration from Family Fun. 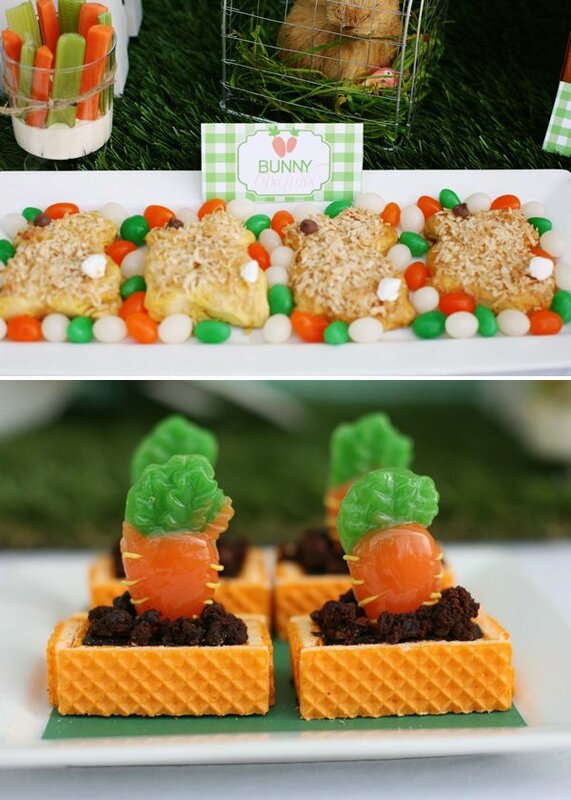 The ingredients were also minimal, using orange creme wafer’s, left over brownie bunny crumbs and carrot lollipops from The Dollar Tree. 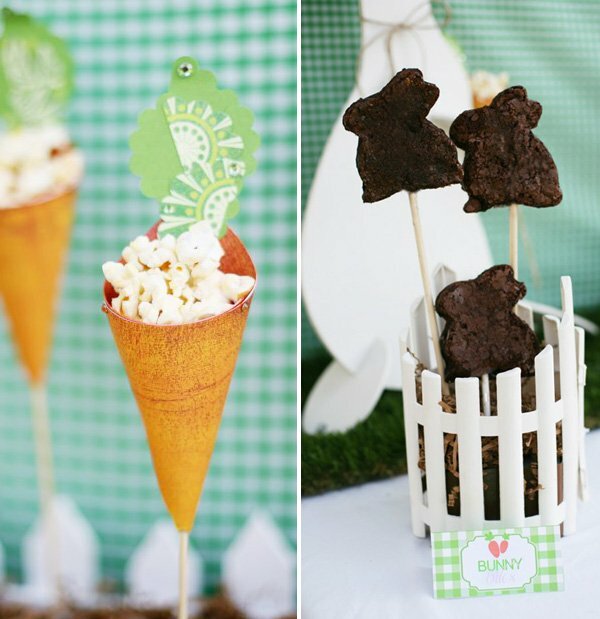 The Carrot Kones from Posh Party Pretties were filled with popcorn and set inside a picket fence utensil holder filled with more craft shred. 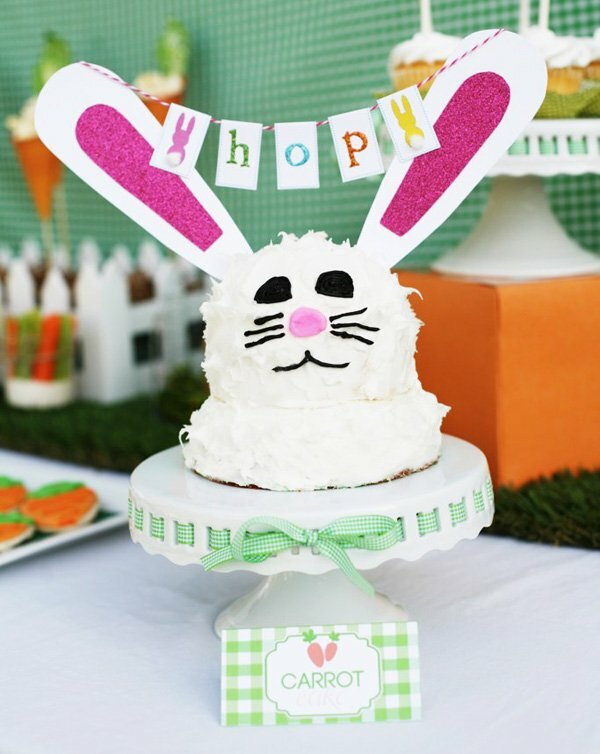 The bunny cake made by Kolby Kakes was dressed with bunny ears and “Hop” banner from The Purple Pug. We always try to incorporate some sort of healthy snack to our play parties, so we cut up carrot and celery sticks and placed them in plastic footed cups (also from Dollar Tree) filled with Ranch Dip and embellished with twine for a Savvy garnish. 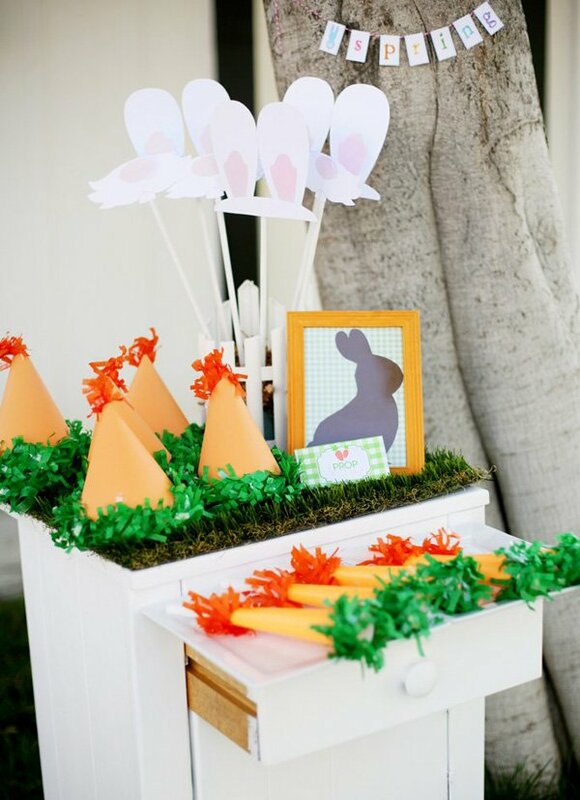 We set a separate table for the props for our “Bunny Hop“. We used a white nightstand as our table. We filled the stand with coordinating orange and green party hats and blowers from Oh Goodie Designs. The “Prop Shop” also included bunny ears and mouths on sticks made by Frog Prince Paperie. Each play party friend was also given their own bunny tail made from cotton balls glued to twine and tied around their waste. Wow! You only spent $85! Great job ladies! 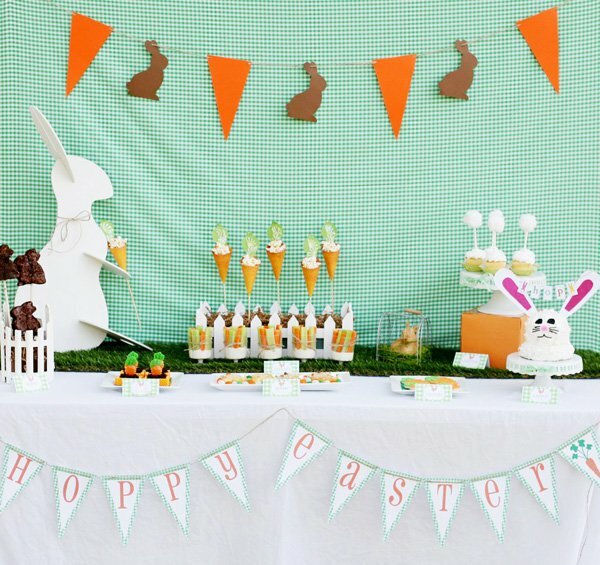 I cannot even begin to tell you how absolutely ADORABLE I think this is…especially from a children’s event planner’s point of view! 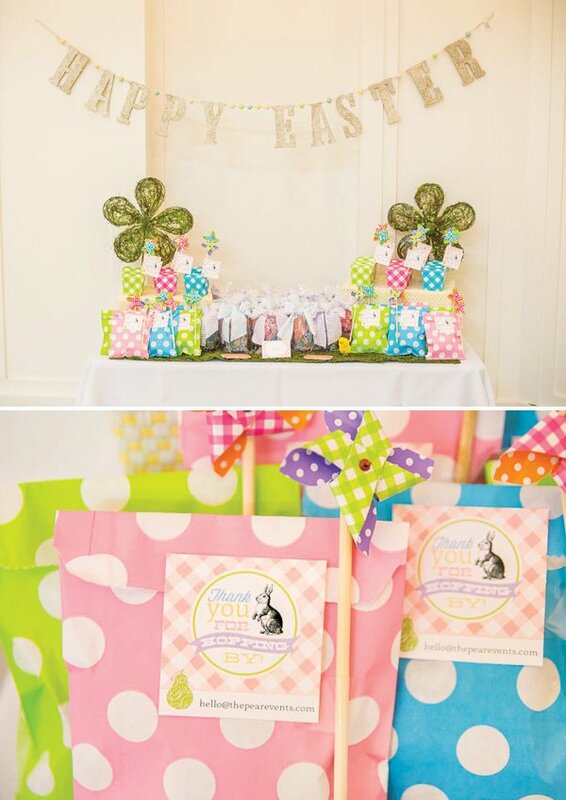 We do parties all the time, but you have quite the gift for planning strategically from what I’ve seen here! Amazing work! 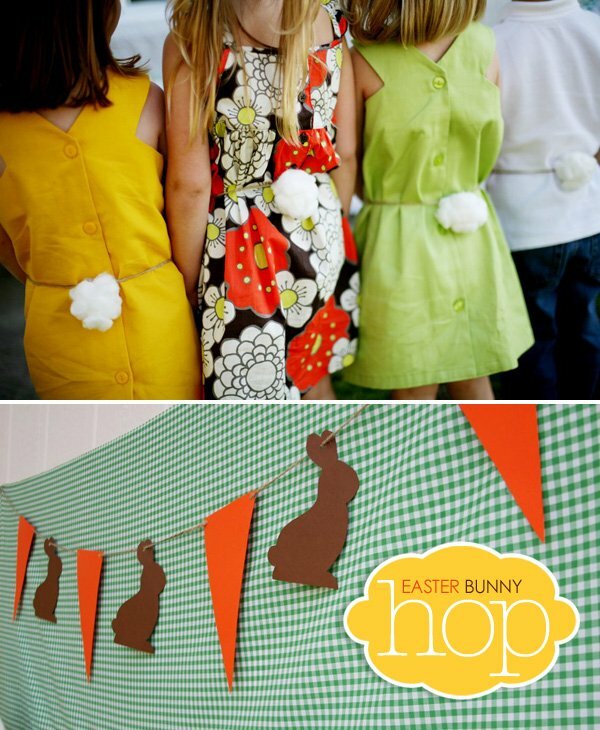 I adore the cotton bunny tails worn by the kids and the tails on the cupcakes! Thank you so much for this post. I want to let you know that I posted a link to your blog in CBH Digital Scrapbooking Freebies, under the Page 3 post on Apr. 12, 2011. Thanks again. Everything was so adorable and it looks like the kids had a blast!! Great job girls! 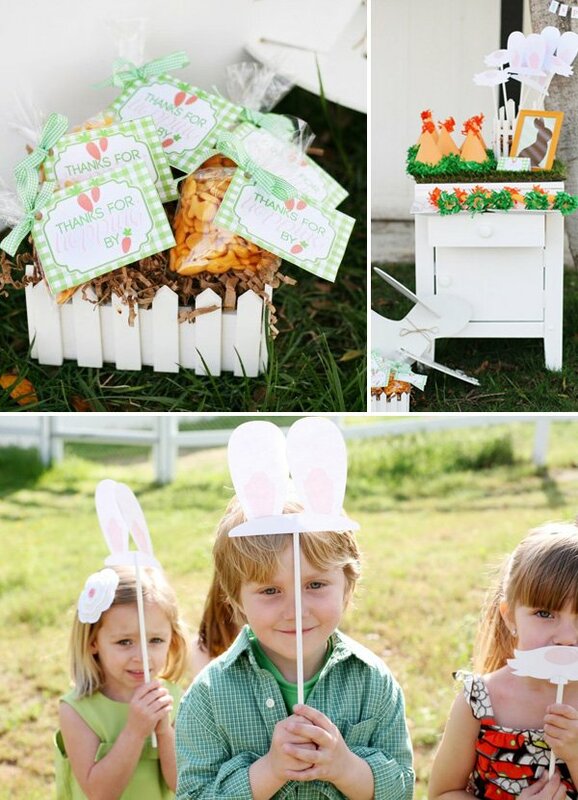 So cute, planning our Easter party now and will definitely be incorporating some of these ideas!!! This is absolutely adorable! It looks like the kids had a great time. How cute are all of these ideas?!?! Really cute party! Love that it has a homespun feel about it ,charming! So cute. 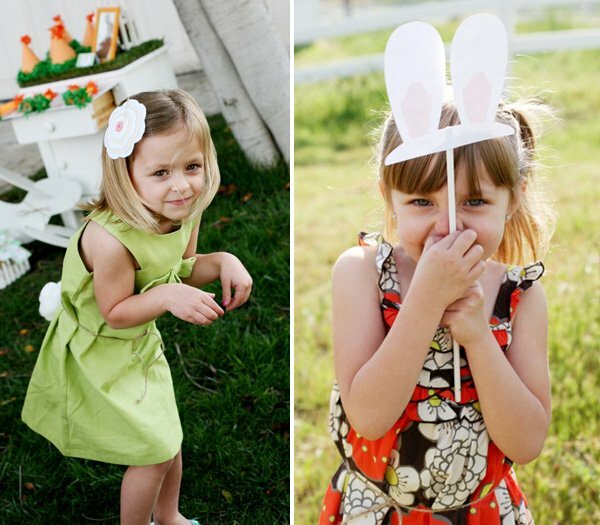 Adopting many of these ideas for my daughter’s Easter Egg Hunt party next week. Where did you find the artificial grass? Home Depot and Lowe’s only seem to have it available in large quantities. 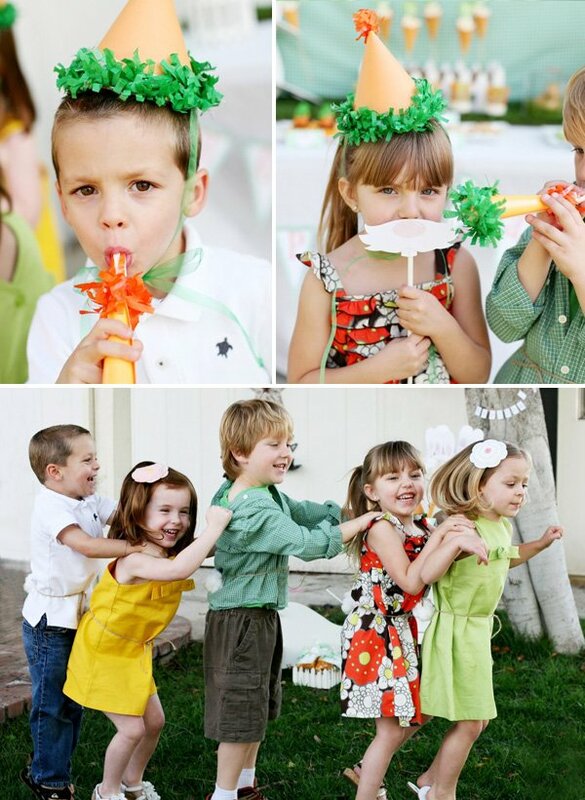 This party is cute beyond words!! Those little cotton bunny tails are so sweet and I love the carrot cookies so much. Great job!! I just LOVE the bunny tails! This party is so ridiculously cute. Bunny party of the century!!! But I think they missed the easiest bunny kid snack of all! 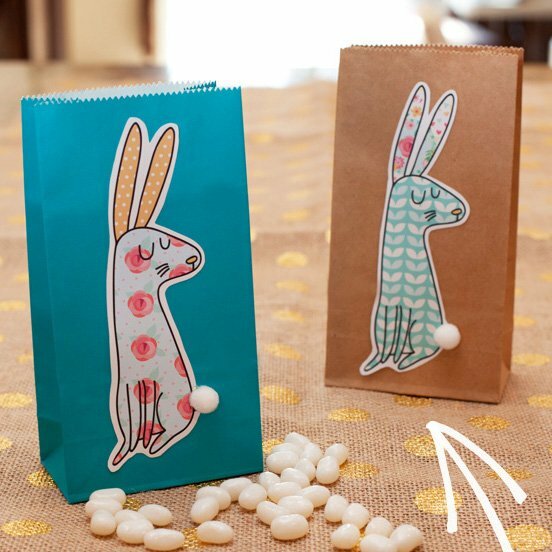 Annie’s Organic crackers are bunnies (instead of the goldfish). I love the Dollar Tree! I can always find great stuff! How did you make those bunny tails?! I need to dress up as a bunny in a few weeks and this would be great! 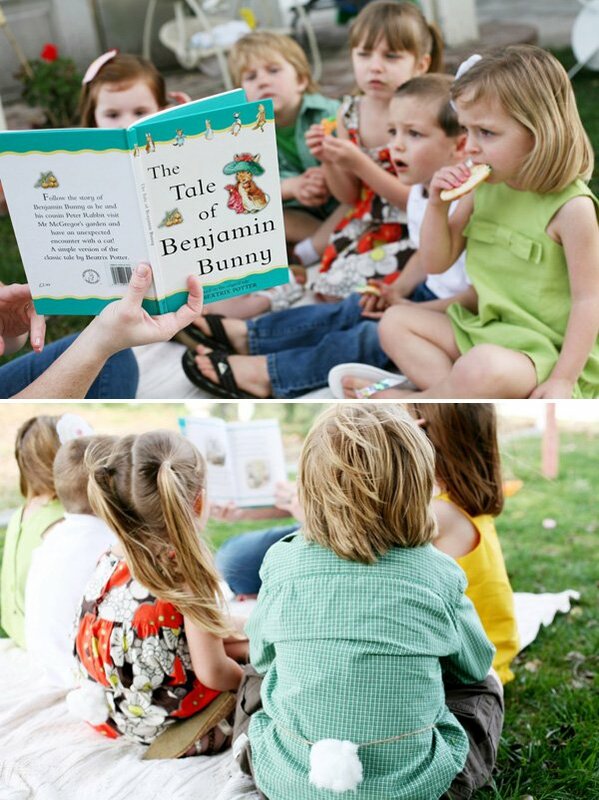 I adore this party, too bad I am reading it the night before Easter! There is always next year! For a tweak on the favor, you could have used Annie’s Cheddar Bunnies. They taste just like Goldfish, but have a very Easter feel. I think my favorite idea you gave was the grass table runner! 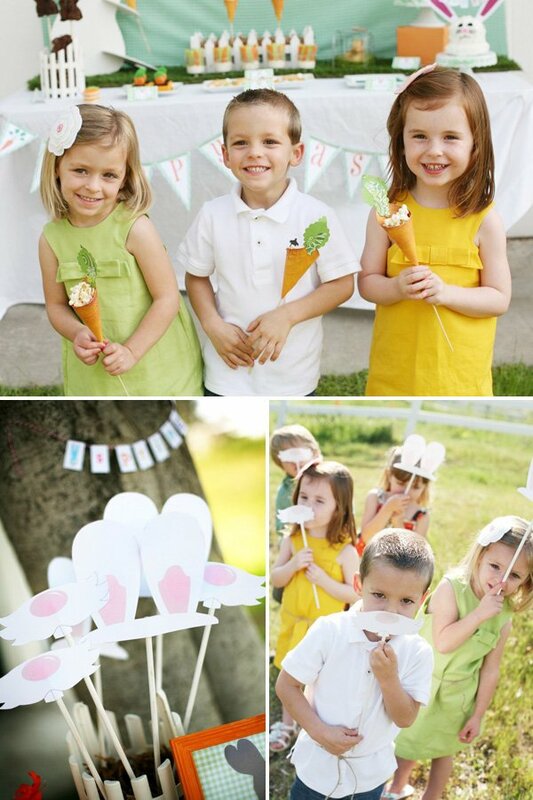 Going to use many of these great ideas for my daughters Max and Ruby bday party! I love it! Where did you get the artificial grass?